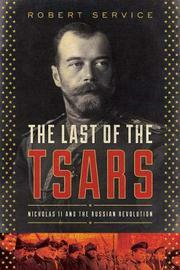 A scholarly biography that goes beyond the gruesome depictions of the Romanovs’ end to examine the more complicated nature of Nicholas II’s character. Using primary sources and documentation unavailable to earlier scholars, British historian and Hoover Institution senior fellow Service (Russian History/Univ. of Oxford; Russia and Its Islamic World: From the Mongol Conquest to the Syrian Military Intervention, 2017, etc.) puts to rest any lingering doubts that the czar’s entire family and retinue were summarily executed in the basement of the Ipatiev House in Ekaterinburg on July 17, 1918. The author provides persuasive evidence that Lenin and the leading Bolsheviks approved of the murders, even if there is no direct evidence of his ordering them. Service meticulously examines the Bolsheviks’ dissembling after the fact; they were reluctant to admit to the entire family’s massacre, rather than just Nicholas’, because of the revulsion such an execution of innocents would inspire in Soviet citizens and the world. Nicholas, having ruled as czar for more than 20 years, was forced to abdicate on March 15, 1917, in favor of his brother, Mikhail, who refused the honor in turn. The family took refuge first at their retreat Tsarskoye Selo, outside of Petrograd, and then were moved to a Siberian exile for the next six months while there still was a Provisional Government. The transit to the Bolshevik bastion of Ekaterinburg in May 1918 was the last move. Service sifts through the record to give readers a sense of family life and routine during this fraught time, especially concerning whether Nicholas in any way altered his convictions in his own beliefs: “His actions were those of a ruler who always thought he was right.” He continued to hold fast as “a nationalist extremist, a deluded nostalgist and a virulent anti-Semite.” The author is particularly fascinated by Nicholas’ choice of reading material, from which he learned to empathize with the lives of regular people perhaps for the first time. A compelling work; organized, concise, and chilling.